The Baptism of the Lord is called Theophany [revelation of God] because in it the one true God, worshipped in Trinity, revealed Himself so palpably: God the Father — through the voice from heaven, God the Son incarnate — through His baptism, and God the Holy Spirit — through the descent upon the Baptized. Here the mystery of the relationship between the persons of the Most Holy Trinity is also revealed. God the Holy Spirit proceeds from the Father and rests in the Son, but does not proceed from the Son. Here also is revealed the fact that the incarnate Divine economy of our salvation is accomplished by God the Son incarnate, coexisting with the Holy Spirit and God the Father. And it is revealed that the salvation of each person can be accomplished no way other than in the Lord Jesus Christ, through the grace of the Holy Spirit, according to the good will of the Father. All the Christian Mysteries shine here with their divine light and enlighten the minds and hearts of those who with faith celebrate this great festival. 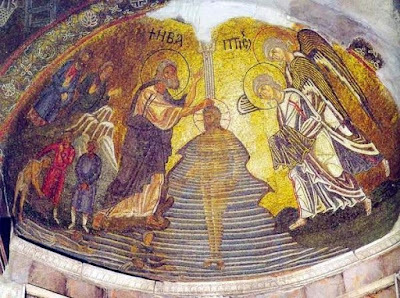 Come, let us mentally hasten on high and plunge ourselves into the contemplation of these mysteries of our salvation, singing, “When Thou, O Lord, wast baptized in the Jordan, the worship of the Trinity was made manifest” — a salvation which in trinity establishes us, and in trinity saves us.